Hauser & Wirth are to inaugurate their new Hong Kong space with new works by acclaimed American artist Mark Bradford, renowned for his large, abstract, mixed-media paintings, which often incorporate ephemera and discarded elements of urban life. This exhibition comes on the heels of a number of major public projects including ‘Tomorrow Is Another Day,’ Bradford’s widely-lauded exhibition for the United States Pavilion at the 57th Venice Biennale (which will travel to The Baltimore Museum of Art in September); ‘Pickett’s Charge,’ a monumental cyclorama commissioned for the Hirshhorn Museum and Sculpture Garden in Washington, D.C.; and a 32-panel, site-specific painting of the entire US Constitution for the new American Embassy in London. The new works presented in Hong Kong are a continuation of the themes Bradford has explored throughout his entire career, most prominently the distribution and representation of power within societal structures. Bradford has long been interested in the ways in which populations, and particularly marginalized communities, are grouped or quantified. In a number of new large-scale paintings, Bradford returns to the motif of the ‘map’ as a point of departure for mining this topic. These works are not rendered from accurate navigational tools; instead Bradford draws his reference material from archival sources, including transit maps, advertising and outdated maps used on bond securities. His base images are therefore only ever subjective representations of a city’s layout, which unintentionally communicate how urban spaces are divided accordingly to the infrastructures of power. Bradford has discussed, in relation to his map paintings, how elements of civic planning – including transit lines and water systems – were diverted around communities of wealth, but built directly through others. Using his signature vernacular of selectively layering, scoring and bleaching areas of his canvas’s surface, and employing networks of colored string, Bradford traces the human presence in these urban geographies and emphasizes the disparate communities and hidden social injustices to which his maps refer. Over the course of several years, Bradford has made works that incorporate merchant posters found on the streets, so that personal notes and political slogans merge with commercial advertising and social calls to action to represent a diverse social index and conflating conversations from across cultural terrains. Bradford returns to the merchant poster motif here in a series of small paintings that derive imagery and language from one particularly poignant advertisement used for his 2013 installation ‘Receive Calls on Your Cell Phone From Jail,’ reconfigured for the Contemporary Art Museum St. Louis in 2016. 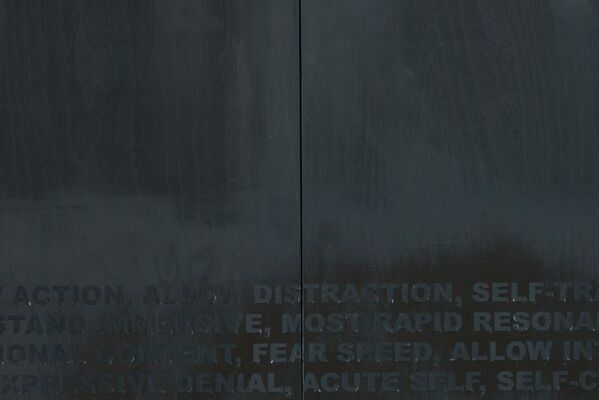 Fragments from the same refrain are repeated throughout each painting, delivering instructions and a phone number for receiving calls on your cell phone from jail. By focusing on these words Bradford draws attention to the social network we are operating within, where a predatory company will take advantage of a population in crisis – the incarcerated – driven by financial gain alone. These merchant poster works are connected to Bradford’s long-term project with the not-for-profit Rio Tera? dei Pensieri – a six-year collaboration he initiated as part of his presentation for the Venice Biennale to help promote the reintegration of former inmates into society. 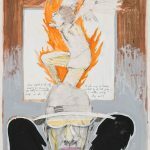 The new paintings consider how our global justice system abandons and disregards the lives of those incarcerated, and how power is yielded over a desperate and vulnerable margin of society. 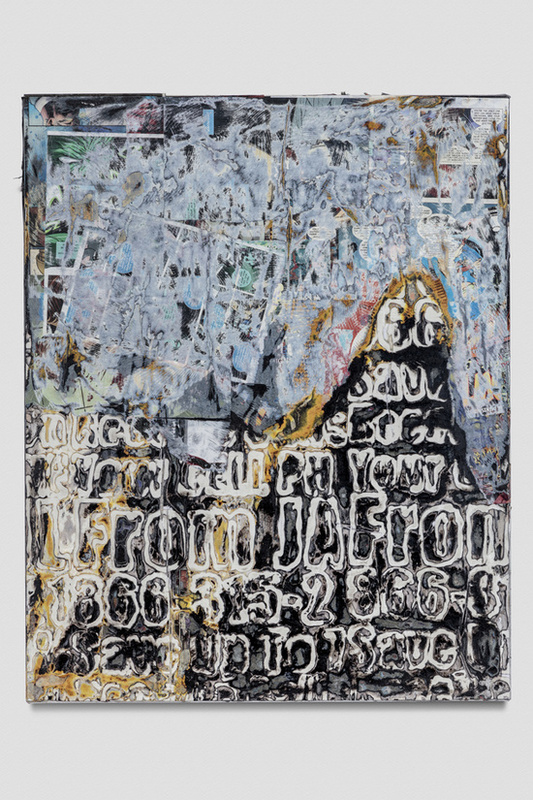 Mark Bradford was born in 1961 in Los Angeles, California, where he lives and works. He received a BFA (1995) and MFA (1997) from the California Institute of Arts in Valencia CA. In 2017, Bradford represented the United States at the 2017 Venice Biennale with a major solo exhibition ‘Tomorrow Is Another Day.’ He also presented a monumental commissioned cyclorama of paintings at the Hirshhorn Museum and Sculpture Garden in Washington D.C., which served as Bradford’s largest site-specific work to date at 400 linear feet. Other solo exhibitions include ‘Mark Bradford. Receive Calls on Your Cell Phone From Jail,’ Contemporary Art Museum, St. Louis MO (2016); ‘Tears of a Tree,’ The Rockbund Art Museum, Shanghai, China (2015); ‘Scorched Earth,’ Hammer Museum, Los Angeles CA (2015); ‘Mark Bradford: Sea Monsters,’ The Rose Art Museum, Waltham MA (2014), which travelled to Gemeentemuseum den Haag, The Hague, Netherlands (2015); and a major touring exhibition presented at the Wexner Center for the Arts, Columbus OH (2010), which traveled to Institute of Contemporary Art, Boston MA (2010), Museum of Contemporary Art, Chicago IL (2011), and San Francisco Museum of Modern Art, San Francisco CA (2012). Bradford has exhibited widely in numerous group presentations such as ‘America is Hard to See,’ The Whitney Museum of American Art, New York NY (2015); Sharjah Biennial 12: ‘The past, the present, the possible,’ Sharjah, UAE (2015); ‘Variations: Conversations In and Around Abstract Painting,’ LACMA, Los Angeles CA (2014); ‘Blues for Smoke,’ Wexner Center for the Arts, Columbus OH (2013); ‘ROUNDTABLE,’ 9th Gwangju Biennale, Korea (2012); the 12th International Istanbul Biennial, Istanbul, Turkey (2011); and ‘Eden’s Edge: Fifteen L.A. Artists,’ Hammer Museum, Los Angeles CA (2007). Bradford was a recipient of the WSJ. Magazine’s 2017 Innovator Award; the David C. Driskell Prize (2016); the US State Department Medal of Arts (2015); the MacArthur Fellowship Genius Award (2009); the Wexner Center Residency Award (2009); and the Bucksbaum Award, granted by The Whitney Museum of American Art (2006). 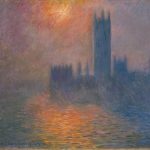 His work is held in many major public institutions worldwide, including The Metropolitan Museum of Art, New York NY; The Museum of Contemporary Art, Chicago IL; The Museum of Fine Arts, Boston MA; The Museum of Modern Art, New York; San Francisco Museum of Modern Art, San Francisco CA; The Solomon R. Guggenheim Museum, New York NY; The Walker Art Center, Minneapolis MN; The Whitney Museum of American Art, New York NY; and Hammer Museum, Los Angeles CA. 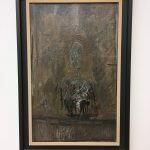 This entry was posted in EXHIBITIONS, NEWS and tagged Hauser and Wirth, Mark Bradford. Bookmark the permalink.